Within this AC Milan Football Accessories page you are guaranteed to find high quality merchandise adorned with your beloved team’s crest for a great price. Sourced straight from the respective manufacturers, we are able to verify the authenticity of our AC Milan souvenirs in order to provide you with 100% satisfaction on your purchase. However, our stock levels of these official souvenirs are relatively limited, so we highly recommend that you finalise your payment imminently to avoid being disappointed when they are all sold out. And at the checkout you will be able to choose from our fantastic variety of shipping services which operate worldwide rapidly. Holding a pint of liquid perfectly, the Peroni glass comes adorned with the club’s crest and AC Milan wording in scripted font. This glass is excellent for holding beer, pop or even water for while you are watching your favourite team play from the comfort of your own home. You can also update your go-to mug with a jumbo one sporting numerous team emblems proudly. Excellent for hot beverages or even milk or water if you prefer, this mug is a fantastic size to drink out of. Made from 100% ceramic, this mug is very durable and is sure to last you many years when adhering to the care instructions correctly. Upgrade your breakfast crockery by ordering a specially designed bowl adorned with the AC Milan crest. Made from a thick high quality material, this is suitable for hot or cold breakfasts and meals which makes it an excellent addition to any fan’s cupboards. Manufactured with a red base and black rolled cuff, the AC Milan woolie hat is sure to keep your head warm during the winter season. Taking centre stage on the front of the cuff is the AC Milan crest and to the rear is the Adidas logo. Produced using 100% acrylic, this beanie is sure to fit a range of fans easily through its stretchy capabilities. Alternatively for the summer months a baseball style cap is more efficient thanks to its peak. To the rear there is also a Velcro strap which can be used to adjust the hat to the perfect fit for your head. 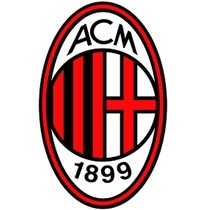 Produced using an all red colouring, the AC Milan crest sits proudly on the front. Along with this, you can also get your hands on specially designed football scarves which come in two different styles. One features the iconic black and red AC Milan stripes across the item with the team branding in the centre and on the ends. And the other has a solid black stripe vertically with red lines above and below it, completing the appearance the team’s branding is situated in the middle and either end of the garment. These can be wrapped around your neck to improve your heat retention during the colder climates, or they can be displayed in your home or like a banner during the AC Milan football team’s fixtures. Containing only one main compartment, the AC Milan crest gym bag is perfect for carrying your gym or training gear within to keep them segregated from your clean clothing and belongings. Displaying the crest and the signature stripes, this bag also has the 1899 establishment date on the front along with the quote ‘#weareacmilan’. With double drawstring straps, you can access the contents of this sack conveniently. A great way to subtly pledge allegiance to ACM for all ages is to have a keyring. This metal accessory features the AC Milan crest proudly placed in the centre amongst black and red stripes. And when it comes to showcasing this souvenir you can do so in a number of ways due to its straightforward and secure fixture loop. You can therefore put this on your car/house keys or you can even attach this to the straps or zips on your school bag. To go with our fantastic variety of high quality merchandise, you can also find the coordinating AC Milan football kits within the team’s category to buy alongside these accessories. All of our stock has been ordered and delivered direct to our warehouse from the respective manufacturer such as Adidas. As a result of this we are able to instil confidence in our customers as they are guaranteed to receive an official items of AC Milan gear when shopping with us. As well as this, our outstanding shipping services aim to reach as many customers as possible in a rapid time period. Therefore to get your order as fast as possible, we recommend choosing the express method for your country i.e. DHL, DPD or Royal Mail Next Day. We also run a newsletter which you can sign up for today for free and receive instant updates regarding kit launches and price reductions. You can also be provided with exclusive discount codes to use towards your purchase too!